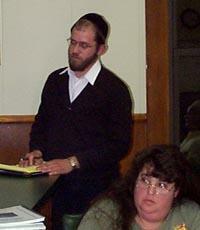 in 2006 KJ Developer Simon Gelb addresses Town of Cochecton planning board. Kiamesha Lake, NY - A developer has scrapped a plan to build hundreds of homes in the Town of Mamakating and is now focusing on building 175 duplexes in the Town of Thompson. Simon Gelb, an area investor with an office in Monroe, initially proposed more than 1,300 homes in Mamakating and Thompson on 2,000 acres, and later scaled it back to 999 homes. He said he has revised the project a third time at the request of the Department of Environmental Conservation and town officials. The two-family homes will sit on half-acre lots on a total of 87.5 acres on Wild Turnpike Road on the Thompson side, where he owns 727 acres. He plans to leave more than 600 acres as open space, officials say. The project has been renamed from Kingwood to Parkwood. Gelb says he is transferring about 200 acres of his Mamakating property to Camp Lakota, pending a lot line approval from Mamakating. He said he also wants to transfer some Mamakating land to the state. "We are negotiating with the DEC right now," Gelb said. "The reason is for protecting natural resources." Gelb did not make it clear if he will build on any of his Mamakating land. With the scaling back of the project, the DEC dropped its role as the lead agency in the environmental review, and the Thompson Planning Board has taken the lead. Supervisor Tony Cellini said that while he opposed the size of the former project, town officials have since had good talks with the developer. "Simon Gelb is a decent person to deal with," Cellini said. "It makes much more sense than it did before." The public scoping session is Jan. 28.